Cleaning, hygiene and catering supplies: best prices and shopping experience guaranteed! At Gopher Supplies we want to be different! We don’t want to be just another on-line shop for cleaning supplies and catering products, which looks exactly the same as all the others, works the same and makes the same bold promises! We want to give you much, much more! Gopher is an on-line shop dedicated to the needs of customers in smaller businesses and organisations, who want all of the price and product range advantages enjoyed by larger concerns, but with a service specifically tailored to their needs. What we want to achieve at Gopher is quite simple: to give you the very best on-line price offer; to be simple, convenient and easy to use; to ensure a safe and reliable on-line shopping experience; and to provide you with a wealth of supporting information so that you can get the very best value from your purchases. Not only that: Gopher is committed to bringing back some of the fun that has been lost both as a result of modern day working pressures and the ‘faceless’ world of on-line supplies! Gopher gives you an absolute commitment that our prices for cleaning supplies and catering products will always be the lowest on-line. We have unashamedly adopted an idea from the supermarket retail world – the Price Check – and regularly compare our product prices with those offered by leading competitor sites, so that we can always ensure that we are the lowest! What’s more, if you can find a comparable product from a competitor site, we will not only refund the difference1 but we will give you a further 5% of the difference2. If that’s not enough, every time you make a purchase from Gopher we will give you Gopher Points, which you can redeem and enjoy further discounts on future purchases. We all know that on many websites, the shopping process can be time-consuming and cumbersome, particularly when trying to find products and navigating your way through the shopping basket and payment process. a very short check-out process, which allows users to use pre-defined address and payment details to short-cut steps used by most shopping baskets. Our commitment at Gopher is to give you a ‘no fuss’ shopping experience for your cleaning supplies and catering equipment, incorporating the most powerful technology currently available. As well, we understand that your need for cleaning supplies and catering equipment and other related products will vary depending upon your sector, whether you are a contract cleaner, chef in a busy restaurant or practice manager in a dental practice. By using our Shop by Sector facility, we present only the products and support information that is relevant to you, helping us to ensure that the cleaning supplies and support information we present is exactly what you need. By using the latest and most advanced encryption technology, Gopher guarantees you absolute security when making payments3 on the site. that you can easily track your purchases and payments. In short, Gopher wants to take all stress out of buying cleaning supplies and catering products, and if things do go wrong, we are there to ensure that they are quickly put right with no fuss. 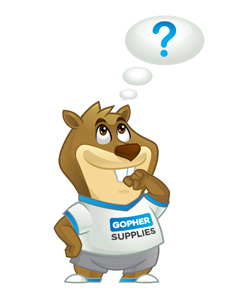 At Gopher, we want to help you make best use of the products that you purchase from us. We have assembled a large number of Gopher Expert articles which provide a wealth of advice and tips, presented in short, to the point how to guides regarding best cleaning and hygiene procedures, and buying or Chooser Guides for a range of key products. Behind Gopher there is a strong team – customer service and accounting staff, warehouse and delivery personnel, and so on – all of whom are committed to conducting business in a socially responsible manner. Gopher is committed to conducting its business in an environmentally aware manner, in terms of both product selections and operating practices, which we set out in our environmental statement. Gopher’s commitment also extends to the wider community, where we have decided to support a number of charities, primarily by donating 1% of every sale achieved by Gopher to charity. Further details are available in our charity statement. Most of us, given the chance, would prefer to buy from people; it is difficult to share a joke with a faceless website! Gopher wants to put some of the fun back into on-line shopping. We hope you like ‘the Gopher’ animations and they make you smile; perhaps you may also be tempted to follow the adventures of Gopher on Facebook and Twitter! Thank you for using Gopher Supplies. We hope you enjoy using the site. Please let us know your experiences, good or bad: write to the Gopher at contact us. We guarantee to personally acknowledge each and every comment that is made.